Last quarter (Second quarter 2013: March 31, 2013 through June 30, 2013) U.S. stocks was the only category which did well. July was much kinder to all the other categories. We use six different asset classes for asset allocation: three for stability (bonds) and three for appreciation (stocks). We divide the asset classes for stability into short money, U.S. bonds and foreign bonds. We divide appreciation into U.S. stocks, foreign stocks and hard asset stocks. The exchange traded funds listed in the chart above are a representative of one of the major holdings in each asset category. Many other holdings tune the asset allocation within each asset class. And there is a wisdom of how to diversify each. Asset allocation means always having something to complain about. Investors are continually looking for the safe investments with good returns. But inflation, sovereign debt, globalization and diminishing U.S. economic freedom make a clear choice difficult. We advise a diversified portfolio that overweights certain subcategories in each asset class. If you have set such an asset allocation, what did poorly this past quarter may be poised to do better in the coming year. If your asset allocation is wrong, change it. But if it is right, don’t abandon a brilliant allocation simply because of short-term returns. Just rebalance back to your original targets. It takes a confident contrarian to ignore the daily market noise and the 24/7 financial news. During 2013 second quarter bond values dropped as interest rates rose sharply. 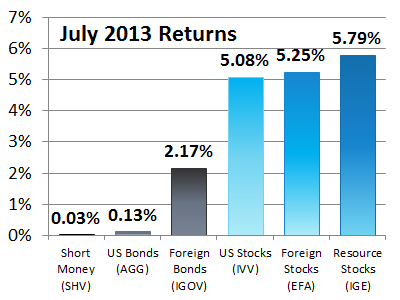 In July U.S. Bonds were back to their meager returns. Representing U.S. Stocks, iShares Core S&P 500 ETF (IVV) was up 2.90% during the second quarter and gained another 5.08% in July. IVV, representing U.S. Stocks, is up 19.57% year to date. Rebalancing at this point often means selling some U.S. stock holdings and purchasing in other categories. Foreign stocks, as represented by EFA, were up slightly more than U.S. stocks in July. This after not having done very well last quarter or year to date. Resource stocks include companies that own and produce an underlying natural resource. These include oil, natural gas, precious and base metals, and resources like real estate, diamonds, coal, and lumber. Resource stocks, also called hard asset stocks, provide an inflation hedge. 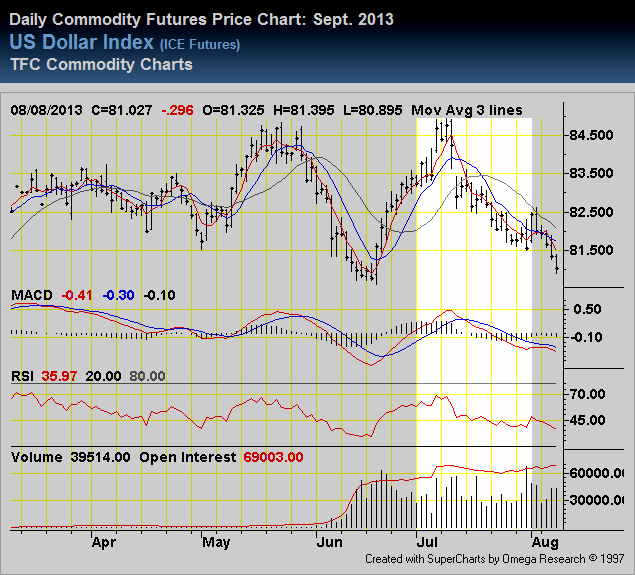 They do well when the dollar is dropping in value and poorly when the dollar is strengthening. iShares North American Natural Resources ETF (IGE) was down 5.07% during the second quarter as the dollar strengthened, but back up 5.79% this month.